To make Maifan Stone Colloidals I start off with mountain spring water that I distill and structure to make it pure and highly absorbent. I then add many of the Maifan Stones to the water and let it site on Orgonite for a few days while its releasing minerals. Then I take a large Maifan Stone and connect it to the positive end of a 12 volt battery and a pure silver coin on the negative side to preform electrolysis for another day. This makes the water highly concentrated in minerals from the stone. Maifan Stone was employed in Chinese medicine for healing in ancient China. According to the Compendium of Materia Medica written by the great herbalist Li Shizhen in the Ming Dynasty, Maifan Stone is fragrant, warm and toxin-free, making it an effective cure for various skin tumors and ulcers. Maifan Stone was subsequently brought to Japan and South Korea, and garnered the reputation of "Stone of Health". Maifan Stones are originated from the uncontaminated sources in Inner Mongolia and Shangdong and are ideal to process for health use. 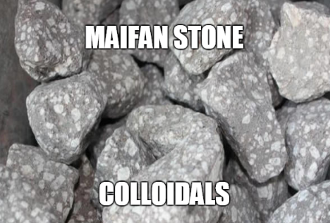 The Maifan Stones contain up to 70 trace elements including potassium, calcium, sodium, manganese that are essential for human blood and fluid system. Its many benefits include pH balance, anti-inflammatory, relieve pain and detoxification. Maifan Stone has function of two-way regulation of trace elements (microelements) and constant in water to reach the best balance of human body needed, so mineralized water and other relative products produced by Maifan Stone has an obvious health effects. Some mineral elements include SlO2, Fe2O3, FeO, MgO, CaO, k2O, Na2O, TiO2, p2O5, MnO, etc., but also contains all the necessary constant elements such as: K, Na, Ca, Mg, Cu, Mo and other trace elements, about 58 minerals for human body. Maifan Stone is a special mineral rock which has for centuries been used to treat various skin diseases. It is primarily composed of silicate minerals including but not limited to plagioclase feldspar, orthoclase feldspar, hornblende, and biotite. Maifan Stone has a huge capacity for both ion exchange and the adsorption of soluble heavy metals and chemical impurities in the water, whilst providing a gentle release of rich minerals and raising pH alkalinity levels. Maifan Stones has an "ozone" effect by improving the biological activity of water with the dissolved oxygen concentration. This is also known as "activation" of water. It is for this reason why Maifan Stone is referred to as a "cell detergent". Maifan Stone has a double adsorption effect with a strong adsorption ability for heavy metal ions and toxins in the water, whilst also reducing the concentrations of bacteria, inhibiting its reproduction speed. Maifan Stone effectively removes mercury, lead, cadmium, arsenic and other heavy metals, fluoride, in addition to disinfection dissolved gases such as chlorine.